An innovative “green” building plan replaces old garages with energy-efficient apartments for low-income tenants and brings much-needed affordable housing to one of New Jersey’s most affluent towns. The Moorestown Ecumenical Neighborhood Development Inc., or MEND, is a pioneering nonprofit community housing organization founded by nine Moorestown churches in 1969 to address the need for much-needed decent, safe, and affordable rental housing for low- and moderate-income families, senior citizens, and disabled individuals in Burlington County. The county’s most recent Human Service Needs Assessment listed affordable rental apartments as a Level One (“most needed”) priority. MEND’s Creed II project does just that in this highly affluent South Jersey town, which was chosen as a “Best Place to Live in America” by Money Magazine in 2005. The development, which opened in early 2007, is a short walk from Moorestown’s Main Street commercial and retail district. It replaces an old garage structure with two two-story buildings that offer eight one-bedroom rental apartments. 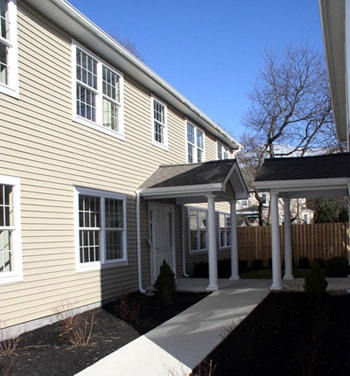 Two of the four ground-floor units accessible to physically handicapped tenants are reserved for the blind and visually impaired, who are supported by a collaboration with Resources for Independent Living of Burlington City. Land-acquisition costs in Moorestown Township are prohibitively expensive; however, MEND was able to use previously acquired land, which made the plan financially feasible. All utility infrastructure was already in place and the site near existing MEND affordable rental housing enabled the organization to operate and maintain the area as one integrated housing development. Nonetheless, the infill site posed unique challenges because it is small and land-locked. The project required several zoning variances and particular attention to footprint locations, set-backs, vehicular circulation, on-site parking, and fire safety. The concerns of existing homeowners about adding low-income housing to their neighborhood were resolved through a negotiation process that involved design concessions, and the overall climate with the local government and citizens was supportive. The colonial style buildings, constructed with energy-efficient building materials, are designed to look like single-family houses, to blend with the surrounding residential neighborhood. Creed II was the result of a three-year planning and implementation process that grew out of a unique public-private partnership in support of affordable housing. Two state agencies and the county provided funding, and the township worked closely with MEND during the long and complicated approval and permitting process. The Builders League of South Jersey, an association of market-rate housing developers, and the development’s general contractor also provided expertise and resources. Through innovative and unique collaboration, MEND worked hand-in-hand with municipal, county, and state agencies as well as for-profit partners, to create rental housing that is attractive, well located, and properly scaled. The Creed II development stands out as an inspiration and model for affordable housing.